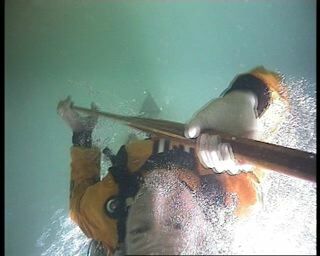 The paddling Pastor from Michigan likes paddling with a 'stick'. Doug VanDoren is a firm believer that you can paddle just as fast and efficiently with a Greenland paddle. Includes underwater rolling footage. The paddling Pastor from Michigan likes paddling with a 'stick'. Doug VanDoren is a firm believer that you can paddle just as fast and efficiently with a Greenland paddle. Doug gives us a few tips on technique while paddling at the Manitou Islands & shows us some of the many rolls he can do, including using a few interesting props! 162MB. Approx 5 minutes. 4 x 3.